Well, here we are, Day Three into the Snowpocalyspe "Hothlanta" world that is Atlanta after a snow and ice storm. For you non-Atlantans, let me paint you the picture of what is going on. Imagine your city being covered in snow, but with no more than 25 plows or ice trucks available to take care of the city. Then, imagine that snow being covered with a half-inch thick sheet of ice, which melts then refreezes a few days in a row, with no salt or sand spread to help. On top of that, the city and state are fighting over what blocked roads belong to which administration. Welcome to our world. It is chaos. Like most of the city, we are literally trapped in our condo, since the hill leading to the bigger road is a sheet of ice. I have yet to have my first day of work (what are the chances?! ), and so instead we have been busying ourselves with movies, reading and Internet surfing. It's been a relaxing mini-break, to say the least. As you might remember from Summer 2009, we painted the living room a bright and cheery yellow on the main wall. It contrasts well with the deep red wall on the other side in the dining room, and I like it combined with the black and white furniture and decor. However, how AMAZING would it look painted that dusty blue/gray? 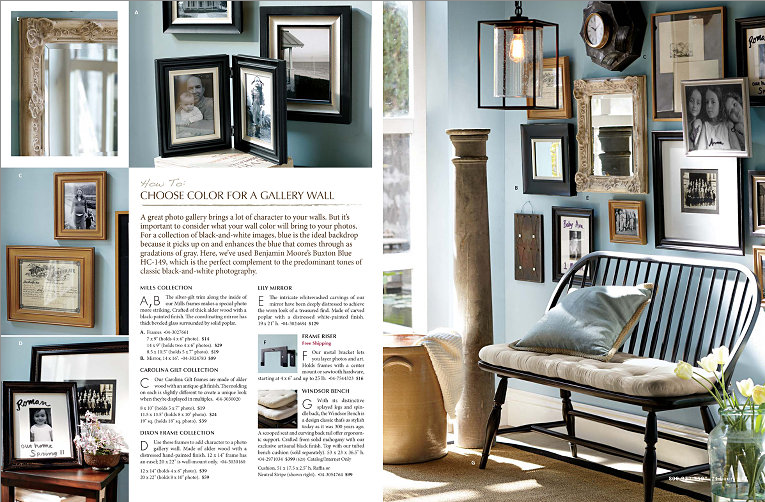 The article talks about how perfect that color is to put behind pictures that are black and white (check), and we could paint the whole room that color, adding up a gallery of more photos around the couch. Even better, this would transition flawlessly from the living room into the green and brown-based Master Suite. Note: Pottery Barn used Benjamin Moore Buxton Blue HC-149. ...and then die from paint fume inhalation! fab! Thanks Lindsay! And I love the look your room has going on!! Funny how we both are inspired by that same type of PB picture. I love that catalog for ideas, even if I can't afford their things. Great idea on the paper to line it up, I did that on the arrangement I have going on too, even though yes, mine is also pretty symmetrical instead of a "gallery" haha.